I recently, as a member of the Green Mountain Club, read an article in their quarterly publication about a man who decided to thru hike the Long Trail using the gear early hikers would have used back in the 1910s (when the trail system was officially open for use). This interesting read got me thinking to how much gear has changed in the past 100 years. I thought it would be fun to do a little research and share my findings with all of you guys. I hope you find it as fun to read as I had writing it! Since the article I read was replicating a thru hike of a trail in 1917, that's as far back as I decided to go. Since the National Park System in the US was developed and created only a few years prior to this, I decided that many people were more than likely not camping recreationally before this period. Granted, people were following their herds to the high country for the summer and camping out long before this, I find that those "headed to camp" accounts don't really make for good backpacking gear stories. photo (and great story) from Seven Days. "For food, bread and bacon will keep you going with little weight." "No person should ever travel The Long Trail without axe, compass, and matches" "A tent is not necessary on most of the trail; it may be needed in the southerly part if the hiker desires to sleep out, in which case a very light, small tent of balloon silk is advised"
I also love that for this hike Mike used birch and beech twigs to brush his teeth! Mike Debonis on his 2017 thru hike of the Long Trail, using 1917-style gear. Gene carried about a week of food at a time, and his favorite foods included chocolate pudding, loaves of bread, and Baby Ruth candy bars. With the 1960s and 70s came the "heyday" of the American National Park System. More and more folks were able to get out and enjoy not only the national parks of our country, but also the backcountry and hiking trails provided by our parks! Check out some of these vintage ads I found while scouring the internet. Heck, I know some sleeping bags that weigh more than 3.5 lb have even tried to make their way out onto a backpacking trip I was leading! 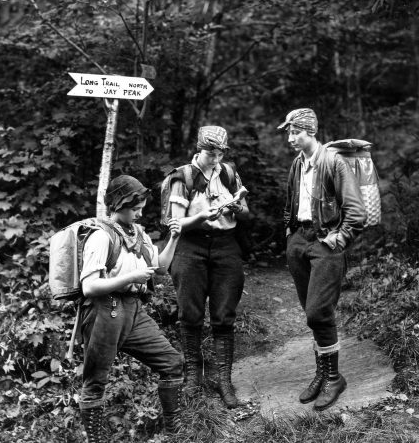 During the late 1950s the AT saw it's first female thruhiker, Grandma Gatewood. She would go on to hike the trail two more times during her life, making her the first multi completer of the trail. While I couldn't find a comprehensive gear list, I did find a photo of her gear (circa 1960) (thanks, Reddit!) at the Appalachian Trail Museum. It's safe to say she was the first ever "dirtbag hiker", hiking with a homemade denim sack, a rain cape made from a shower curtain, and was the first hiker to ditch the heavy boots for lightweight shoes, recommending Keds to all hikers she met! She was also the first thru hiker to "slackpack" her way along the AT. She often wandered off the main trail to knock on doors to ask for a place to stay or to get a hot meal. Photo Courtesey of the AT Museum and google images. The 1970s is when backpacking really started changing. Jansport and Kelty led the way in creating lightweight external frame packs with specially designed pockets for hauling gear ergonomically. Also during this era we see the very first Therma-A-Rest mattress hit the market. Now, instead of cutting live tree boughs, hikers can sleep on an ACTUAL mattress in the woods! Check out the weight of those "lightweight boots" by the way - only THREE POUNDS! You also start seeing the commercial freeze dried and dehydrated food industry taking off. Yes, America - you too can eat like our astronauts! Lightweight was the name of the game! Ultralight was truly being developed during this time period, despite how many of us would think it was something more recent. In fact, 2-lb packs were being developed during the late 1970s and early 1980s! Nike was even on the forefront of developing a lightweight hiking shoe/boot hybrid - the Lava Dome! While many folks were still carrying external frame packs during this period, the frame during this time started moving to the INSIDE of a pack - something unheard of before now! 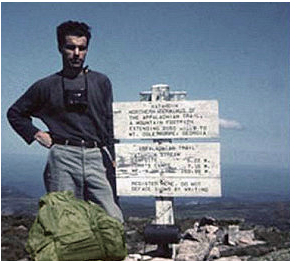 During this time period we also meet some of THE names in backpacking that many hikers still know today, the most famous of whom is Ray Jardine. Ray and his wife, Jenny, began thru hiking in the late 1980s and can still be found out on the trail today. In 1991, Ray wrote a book about his PCT thru hike, talking about how it was possible to hike much faster and lighter by making homemade gear. In fact, he still regularly publishes and hikes today. During the 1990s we see many what we would call "Cottage Industry" companies starting to pop up as well. Dana Designs and Gossamer Gear both got their start in the 1990s when regular hikers started getting fed up with not being able to find what they wanted in gear that was commercially available. These days, fast and light is the name of the game. With more and more FKT (fastest known time) attempts on the trail and more hikers getting savvy to the "less is more" way of backpacking, it's possible to hike more than 2000 miles carrying little more than a daypack. Some of the more famous names in the game right now include Anish, String Bean, and Lint. For an example of what these ultralighters are carrying, check out Lint's thru hiking gear list. While not everyone is going ultralight, it's pretty unusual to see anyone out on the trail these days carrying more than 35 lb. We know now that the average pack should be 25% or less of your total body weight. With lighter packs comes the ability to wear lighter shoes as well. In fact, reading surveys of commonly used gear online you'll see that less than 20% of hikers are now wearing boots on trail, opting for lightweight trail running shoes instead. And there you have it - a pretty comprehensive history of how gear has changed since the early days! Gone are the days when heavy boots and 50-lb packs are the norm. Here to stay are the lighter, easier to carry packs with quick drying shoes and gear to get you from point A to point B in relative comfort! Would you have been able to thru hike Grandma Gatewood style? When did you first start collecting your backpacking gear? What piece of gear do you remember and miss the most?